My name is Allison “Ali” Holzman, and I’m a Democrat running to be your representative in the Wisconsin State Assembly (75th District). 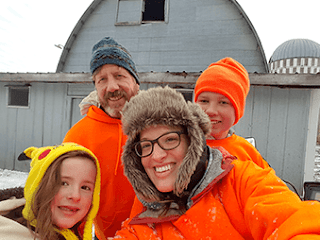 I raise cattle, sheep, goats, and chickens with my family on a small farm outside Cumberland, and I also manage the regional office of the Wisconsin Education Association Council in Rice Lake. My daughter, Olivia, is going into 3rd grade at Cumberland Elementary School. I feel so fortunate to be able to live here in the 75th district. I've lived in many parts of the country, in towns ranging in population from 99 to 300,000. I know the value of rural communities, which is why I’ve chosen to raise my daughter in this wonderful area. As a full-time working mom, I understand the balancing-act so many families in our district go through every day, and that’s exactly why I’m in this race: We need more people in government with the same real-life experiences as the folks they represent. Politicians in Madison are putting policies in place that specifically benefit a very select few people, and they're doing so at the expense of our communities, our schools, and our families. We need lawmakers with new priorities - representatives who will invest in our communities and the hard-working families who live here.